Our handheld and mini units are specially designed to treat small patches of psoriasis, vitiligo, eczema etc. on the hands, scalp, elbows, knees, and so on. They are perfect for treating one or two localised areas. 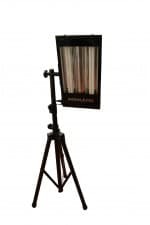 The handheld UVB lamps are fitted with market leading Philips PL01 Narrowband Tubes, the small version of the Philips TL01 Narrowband tube to aim the treatment exactly where it is required. 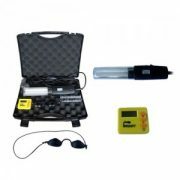 The hand-held unit is fitted with a 9w Philips PL01 Narrowband tube, and comes with a removable comb attachment, plug adaptor, timer, goggles and instruction booklet. The mini unit comes with a stand and uses two of the Philips Narrowband PL01 36w tubes. The swivel stand allows you to adjust the angles, and can be used standing up, over a chair, or over a bed (in some cases). The unit is also useful at treating small localised areas and is more powerful and has a larger light face than the handheld unit but is not suitable for treating large areas of the body. Both options come with a 12-month warranty and 0% finance is available on the mini unit. Please note – these devices are not suitable for those who suffer from a skin condition over the whole body or for people who have many small patches. 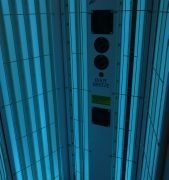 People who suffer from a more widespread skin condition need to look at our range of UVB narrowband canopies and cabinets for that complete full body and all over treatment. At MBS we are also able to provide chronic sufferers with a VAT exemption. For this purpose, chronic means either that the condition is constant, or it recurs frequently.